Every summer my dad makes weekly or biweekly runs to a farm stand just over the bridge in New Jersey. NJ is known for amazing Jersey tomatoes so he always gets those, and today he picked up some sweet corn and zucchini, too. I didn't need much else to inspire me to make this dinner tonight! I decided to use my julienne slicer to julienne the zucchini, keeping it a similar shape and size as the spaghetti (I had some leftover, plain cooked spaghetti in the fridge from the weekend). I also had some roasted red peppers my dad made that I also cut into long, skinny strips. 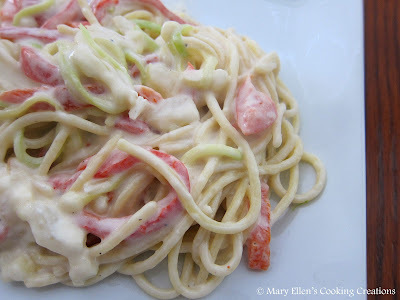 And since most of my ingredients were on the sweeter side, I decided to keep the sauce mellow and subtle rather than make a salty, Parmesan or Pecorino Romano cream sauce. Instead, I used a mixture of cream cheese and Parmesan cheese which perfectly complemented my ingredients. My final decision was how to cook the corn. Have you seen this video on YouTube about the easiest way to shuck, clean and cook corn? My dad first told me about it, and I almost didn't believe it until I saw it. You throw the entire ear of corn, husks and everything, into the microwave and cook on high - 4 minutes per ear. When you take it out - carefully, it's hot! - chop off the end and shake. The cob of corn falls right out and it is perfect clean. It really works! Once it was out I cut the corn off the cob using a sharp knife. So in ten minutes - maybe 15 - I chopped a few things, made a sauce, cooked the veggies, and threw everything together with the pasta. So easy! I loved this and so did my daughter. It tasted like summer, had great texture from the different vegetables, and the sauce was sweet and creamy and went perfectly with the rest of the dish. In a large saute pan, heat the olive oil and butter. Add flour and whisk for a few minutes until you have a nice roux (no lumps, creamy but thick). Add the cream and bring to a simmer. Add the cream cheese and Parmesan and whisk until smooth and creamy. Season with salt and pepper. In the meantime, heat a touch of olive oil in a small pan. Add the onions, garlic, and zucchini. Saute 3-4 minutes. Note: you could cook the onions, garlic, and zucchini in the large pan before you add the flour, but I prefer making my roux separate from the veggies. Cook the corn in the microwave using the method above; cut corn from the cob. Put everything into the sauce - onion/garlic/zucchini mixture, cooked corn, sliced red peppers. Toss. Add pasta, toss. Adjust seasoning if needed.